6 jars of your choice. All must be 24 ounce sized jars. From Tina Vincent of Lakin, Kansas on 7/27/2017 . In my 6 pack of 24 oz jar assortment there was a 16 oz jar of Medium Hot Cauliflower. The liquid in the jar had a brown tinge to it. All the jars were supposed to be 24 oz, so I'm not sure why this odd jar was put in place of the larger jar I ordered. From Judy of Bettendorf, Iowa on 8/2/2015 . 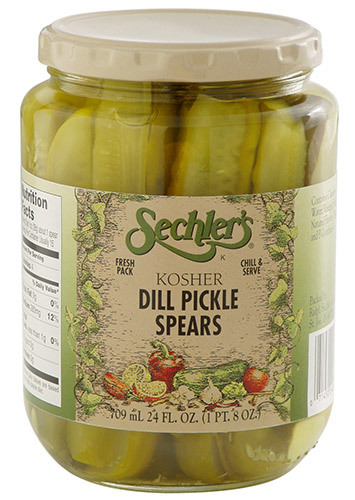 These pickles are exellent. I would highly recommend them. The shipment was very fast also. I will buy from them again. From Donald Peters of Cedar Lake, Indiana on 4/6/2015 . From R Dean Tutor of Memphis, Tennessee on 3/13/2015 . From Anonymous of Emery, South Dakota on 1/28/2015 . After taken the tour with Granddaughter this past summer, her purchase was quickly eaten. This winter we decided to purchase her favorite and a new flavor and had them mailed to her home in Indiana! Not only are we hooked on your sweet pickles, but now the granddaughter is also hooked on the dill flavor! Thanks again for all the great products! !